By default, you can't use CDI in your JSF 2.0 applications when they are simply deployed to a standard servlet engine such as Tomcat 7. But, with Weld, you can make it work. The JSF specification was ahead of the pack when it came to working with and annotating managed beans. However, as the JSF 2.0 specification was getting wrapped up, another JSR specification, JSR 299, was being developed as well. Frustratingly, JSR 299, the Contexts and Dependency Injection (CDI) specification, provides a much more flexible and extendible implementation than the fairly limited JSF implementation. As a result, it's recommended that if you're developing a JSF application that will be depolyed to a Java EE 6 compliant applicaiton server, then you should be using CDI, and not the standard JSF annotations. To summarize, if you do have CDI available to you, it provides a far superior programming model to the @ManagedBean/@ManagedProperty model that JSF2 inherits from JSF1. So superior, in fact, that the EE 6 web profile does not require support for @ManagedProperty etc. The idea being that you should just use CDI instead. 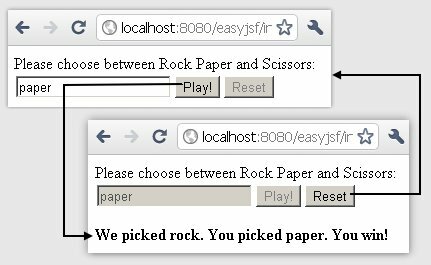 I'm going to recreate the Rock-Paper-Scissors application and use CDI annotations instead of the JSF ones. To keep things separate, I'm actually going to copy my current, working, JSF application which is saved in a folder named _easyjsf, and copy it all to a folder named _easyweld. With that done, I'm going to edit the GameBean to make is Serializable, and to make it use the CDI annotations that correspond to the JSF annotations we've been using up to this point. So, to redo our GameBean using CDI instead of JSF annotations is fairly simple as far as the coding goes.We simply replace @ManagedBean with @Named and we replace the JSF @SessionScope annotation with one from the javax.enterprise.context package. Note than any @Named annotated JavaBean must implement the java.io.Serializable interface. The JSF frameworks isn't quite as strict about serialization, but CDI and Weld is unrelenting. Now, if you were using a Java EE 6 compliant application server then you could deploy this immediately and it would all work. Unfortuntately, CDI support doesn't come with a standard servlet engine like Tomcat 7, so if you want to deploy a JSF application that leverages CDI annotations, well, there's a little bit of work to do. 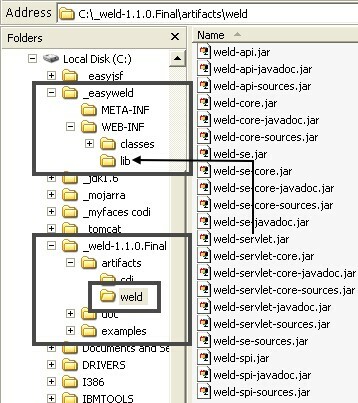 When the download is extracted, you'll find an \artifacts\weld subfolder within the distribution, and that weld folder includes a file named weld-servlet.jar that needs to go into the WEB-INF\lib folder of your JSF application. This weld-servlet.jar includes every Java class you need to link to at runtime in order to turn Tomcat 7 into a functional CDI compliant container. 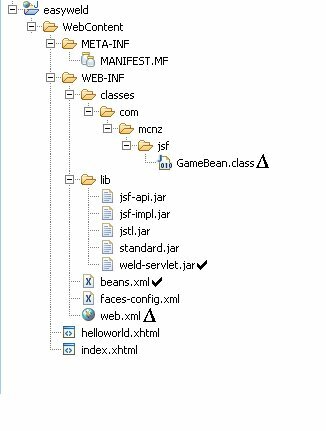 And finally, if you want everything to work, you need to add in an empty beans.xml file alongside the web.xml and faces-config.xml file in the WEB-INF folder of the application. But that's all there is to it! Once you redeploy to Tomcat, and perhaps even bounce the server if need be, the application will re-run, and it will be using the JSR299 CDI annotations instead of the ones provided by the JSF framework..